Eucalyptus gunii in a three-necked round-bottomed flask and a molecule of eucalyptol, the main ingredient of eucalyptus oil. Plants cannot run away from pests and diseases, so they have evolved an impressive arsenal of defensive chemicals in their arms race with insects and herbivores. We take advantage of their ingenuity in many ways and if you are currently laid low by the first autumn sniffles or “Fresher’s Flu”, you may well rely on some of these plant-derived compounds to relief those pesky symptoms while your immune system gets on with the job of mounting its own defence. 1. The image above shows a few twigs of Eucalyptus gunnii, a species of the eucalyptus tree popular in the UK because it is quite frost hardy, quick-growing, evergreen and considered quite attractive, especially its juvenile leaves (shown). These have been fed into a three-necked round-bottomed flasks, which is often used in the synthetic chemistry laboratory as it can be used with a condenser, which prevents the evaporation of solvents when the reaction is heated, and still leaves you with two further points of access, useful for adding and removing material as the reaction progresses. 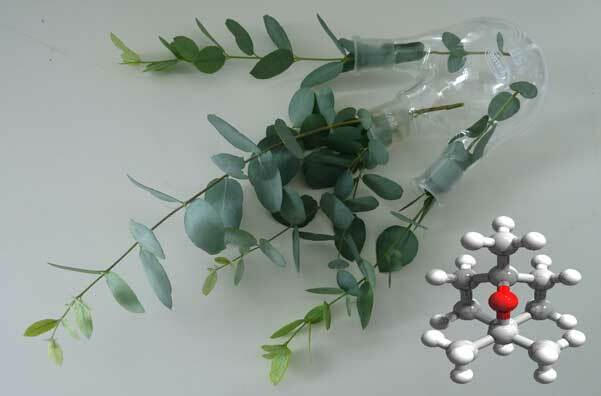 Also in the picture is a rendered image of the main ingredient of the eucalyptus oil distilled from various species of eucalyptus (most commonly Eucalyptus globulus), which is often referred to by its common name, eucalyptol. Despite its name, eucalyptol has actually been found in a range of plants with aromatic leaves, for example basil, sage and rosemary, although it is not the dominant compound in the oils found in these plants. 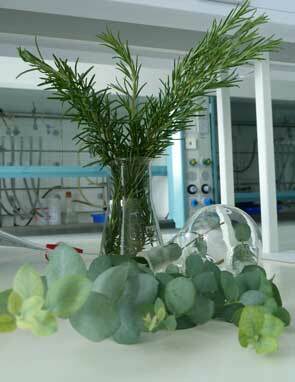 Eucalyptus and rosemary – both plants contain eucalyptol. As mentioned in the top section, many plants have evolved to produce oils which are sufficiently volatile to evaporate and surround the plant under normal weather conditions, providing a defensive cloud to deter pests and herbivores. Many of these so-called essential oils have also been found to have antimicrobial and antifungal properties, providing protection against smaller attackers as well. This heavy-duty arsenal can backfire sometimes: these oils are very flammable and Australian wildfires can spread quickly in the native eucalyptus forests. In addition, some herbivores (such as the koala) and insect pests have not just evolved a tolerance to eucalyptus oi, but actually rely on this plant for their food and survival. Our colleagues over at Molecule of the Month can tell you more about the metabolism pathways for 1,8-cineole, another name for eucalyptol. Humans use eucalyptus oil in small doses in cookery, perfumery and medicinally (it can be harmful in high concentrations), and it can be present in cleaning product and insect repellents; it is also possible to use it as a fuel. (For a study of the antiviral activity of essential oils, see Phytotherapy Research 2010, 25(5), 673-679, the antimicrobial properties are discussed here: Current Opinion in Biotechnology 2012, 23(2), 136-141). At this time of year (autumn), you are perhaps most likely to come across it in cough sweets and suppressants, as it has both antibacterial and decongestant properties, and can also help to relieve a headache (plenty of relevant references in the wikipedia entry here). However, before you rush out and plant eucalyptus in your garden, bear in mind that most of the species are very fast-growing and can become invasive, with branches breaking off easily, so plants need to be looked after properly. Fig. 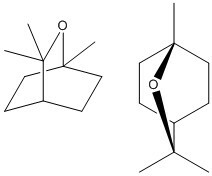 1: Structural drawings of eucalyptol, 1,3,3-trimethyl-2-oxabicyclo[2,2,2]octane, showing the bicyclic structure (left) and the ether linkage (right). 2. Eucalyptol, often also called cineole or 1,8-cineole, is more formally known by its IUPAC name 1,3,3-trimethyl-2-oxabicyclo[2,2,2]octane. The formal name points to some of the key structural features of this molecule – it is bicyclic, with 8 atoms making up the core of this structure. Its structure can be derived from a 6-membered saturated cyclohexyl ring, to which a bridge of one carbon and one oxygen has been added (Fig. 1). The bridge actually contains an ether group, i.e. an oxygen connected to two alkyl groups and the adjacent carbon atoms have been substituted with methyl groups. The compound does not dissolve in water, but can dissolve in a range of organic and halogenated solvents. Essential oils can be obtained from plant material by extraction with solvents or supercritical gases (more about this in the post on Roses) or distillation, and steam distillation can be used to avoid decomposition at high temperatures. The introduction of water vapour (in which eucalyptol does not dissolve) affects the combined vapour pressures of the resulting mixture (explained in much greater detail here), leading to boiling at lower temperatures and thus allowing the purification of oils which might break apart or react with other compounds if subjected to higher temperatures. 3. Most recent publications about eucalyptol in the research literature are not so much concerned with the chemistry of the compound itself, but rather the extraction and analysis of essential oils from different plants and materials produced from them (see, for example, RSC Adv. 2013, 3, 6065–6075, Journal of Analytical and Applied Pyrolysis 2010, 88, 91–97 and determining the antimicrobial and antiviral activity of eucalyptus oil (see references in section 1 for some examples). There are known routes for the synthesis of this compound (Tet. Lett. 1986, 27(19), 2075-2078) and improving and controlling its formation can prove a testing ground for new synthetic routes (J. Mol. Catal. A 2006, 259(1-2), 99-102). Straying a little away from chemistry, I found the following research paper quite interesting: J. Chem. Ecol. 2012, 38, 204–212. Contributors: Simon Perks/Jenny Slaughter (photography), Natalie Fey (the rest). Reblogged this on Fey Group Webpages.